Peut être Berne Radio à Prangins 46°24'24" N 6°15'4" E ? Last edited by AF4MP : 28-08-2018 at 03:55. Reason: added "à"
Perhaps it is time to go out in Switzerland and look for cell towers with Log-periodic antennas, microwave links, and discarded cardboxes?! Last edited by Digger : 31-08-2018 at 02:50. To what is of use these transmissions DRM no sound and no display of the station, it is totally rubbish. I think Bern Radio closed down some time ago, didn't it? At least German Wikipedia notes it stopped operation in March 2016 but no word about what happened to the antennas. I have strong DRM signal this morning, signal is curious, DC Frequency of DRM Signal is variable from 6800 hz to 9046 hz. 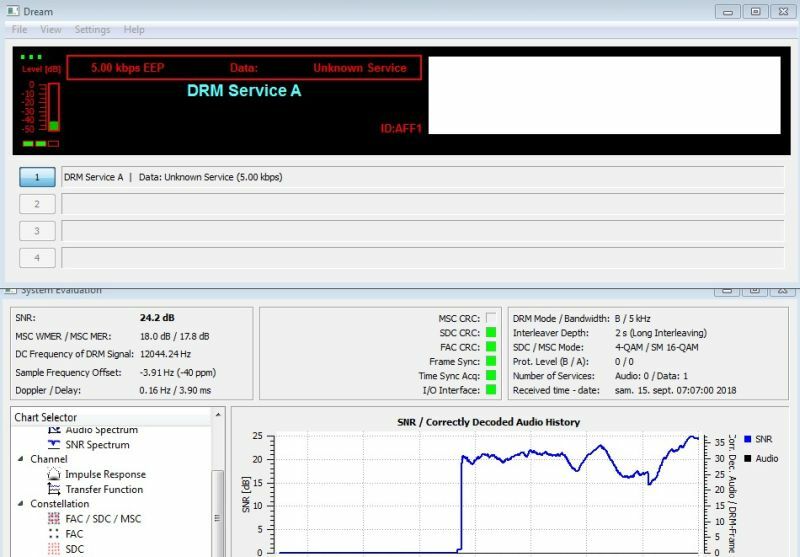 signal is curious, DC Frequency of DRM Signal is variable from 6800 hz to 9046 hz. Don't know if you've successfully decoded the FAC/SDC stream. I noticed their signal spectrum has to be flipped to be recognized properly by Dream in contrast to other broadcasters.Their SNR plot across the 10KHz BW also shows distinctive triangular shape even there is no interference present, which indicate poor TX calibration. Any kind of audio drop-out is worse than any kind of low quality audio: No audio, No log report.